The first performance of the Company’s project restoring the seven lost pansori stories, Aerang and Baebijang proved that the National Repertory Season is meaningful and that it can bring concrete results, thus becoming the Theater’s representative work. Sold out at 97% on average for its premiere in 2012 and its encore in 2013, the changgeuk was acclaimed by an audience of 10,000. 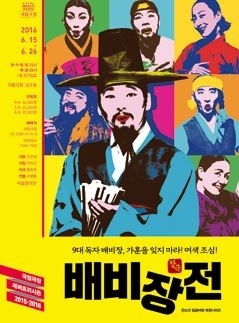 The changgeuk is based on the original pansori, Baebijang Taryeong. Although its song has been lost, the story where its main character Baebijang pretends to be of noble character but fails to do so when attracted to the gisaeng Aerang. Based on this satire and humor pointing out human hypocrisy, director Lee Byung-hoon and playwright Oh Eun-hee made the piece easy and enjoyable to today’s audience. The Company’s actors are determined to reach the culmination of comedy. This comic changgeuk delicately combines the nostalgic scent of the classic, the beauty of traditional Korean sounds, and today’s modern humor.